The Manrose Deluxe Quick Internal Fit Wall Kit can be installed entirely from the inside of a property, reducing installation time and removing the need for costly and time-consuming external grille fitting involving scaffolding. This innovative new wall kit includes an adjustable wall liner and external grille with a rubber seal on the outside of the building. The wall kit can be adjusted to wall thicknesses anywhere between 225mm and 390mm - just measure the wall, then use the guide on the tube of the wall kit to set it to the correct length. Simply insert the tube into the hole, deploy the external grille and 3 pins will hold the wall kit securely in place. The external grille and seal can then be pulled back against the external wall so a tight fit can be achieved. The external rubber seal covers up any break-out on the external hole and leaves a clean, tidy finish. In addition, the rubber seal will help to protect against water ingress. The wall kit is also suitable as a passive air inlet grille. DHRIWKB – Brown Deluxe Quick Internal Fit Wall Kit with Brown external grille and rubber seal. DHRIWKWBS - White Deluxe Quick Internal Fit Wall Kit with White external grille and rubber seal with Backdraught Shutter. DHRIWKBBS – Brown Deluxe Quick Internal Fit Wall Kit with Brown external grille and rubber seal with Backdraught Shutter. 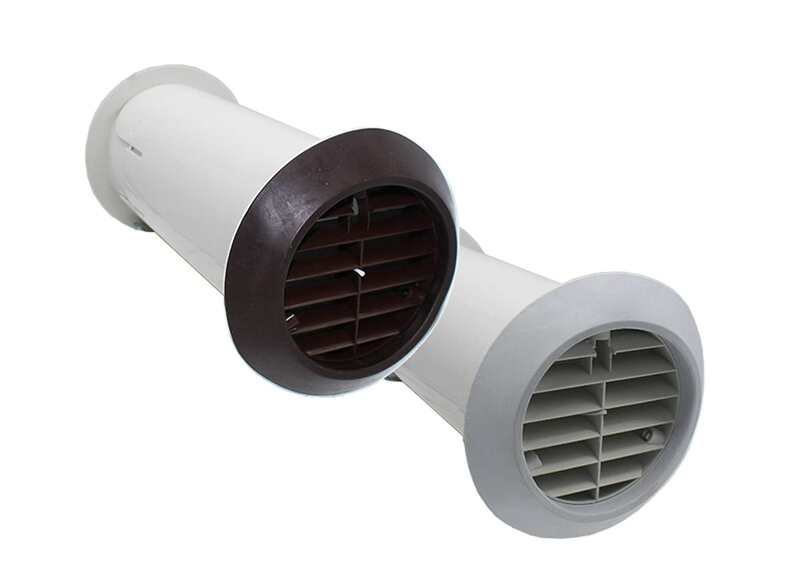 Designed to fit through the wall in a 117mm hole with a maximum depth of 390mm and a minimum depth of 225mm. Can be used with any 100mm fan - select model without integral backdraught shutter if fan already has them.